The History of Tramp Art. Artisans Gallery. (256) 886-2809. Welcome to Artisans Tramp Art, Folk Art, and Unusual Antiques. Mail order since 1987. Internet sales since 1995. Satisfaction Guaranteed. Please note that the information which follows is as printed in their book. We do not agree with some of the statements but they are shown here as written for your use and to be true to their book. Our perspective on some of the history of tramp art is that the name originated from the old German and the carving was practiced by itinerant carvers as part of their moving to gain their craft trampen as part of their apprenticeship during midieval times. Although much of tramp art is anonymous work, we, and others, have found some with history and written records of the carvers. Further, we do not find that most of the carving was done in so-called Hobo Jungles, but rather by people who we able to spend time in one place, many in their workshops or homes. With this said, we hope you do enjoy and benefit from this following article. "... Tramp Art is also a wanderer's art form: so again, there are no written records of the carvers' work. The stories of this art form became the facts; the misconceptions became the truths. There were no rules for constructing the pieces; materials were whatever the carver had available; decorations were whatever he could produce or find. Within the context of his own imagination, experience, and abilities, the carver assimilated what he saw with what he had to work with. He then translated and created what he saw into works of art by using his pocketknife and the ever-present cigar box. Like the hobo, the tramp was a wanderer, but unlike the hobo, he was not a worker. Most tramps lived by their wits, some by petty thievery and begging, some by robbery and murder. The hobo feared the tramp and was contemptuous of him as a loafer, while the tramp despised the hobo as a sucker for working. The distinction between tramps and hoboes, however, was not always discernable. Many men, and women, lived in both worlds, hoboing to make a "stake," then living without working until the stake ran out. Some hoboes became tramps, especially when there was no work to be found, and some tramps became hoboes. But even though tramps and hoboes often lived in different worlds, as far as work and philosophy were concerned, they were forced to share the same space. Hoboes and tramps together flipped the same trains, ate and slept in the same jungles, and were locked up together in the same jail cells. The tramp world, however, had its own society separate with its own rules and its own hierarchy. At the top of the list was the "profesh," or professional tramp. He was distinguishable because of his good clothes, his habits of neatness, and that he often slept on newspapers. The typical tramp, as we think of him, was a "fakir." He was part conman and part repairman or apprentice of a trade, such as a tinsmith, carpenter, blacksmith, etc. Many fakirs were very skilled but preferred to wander from town to town, searching for work when they felt like it. The common meeting ground of both hoboes and tramps was the "jungle". The jungle was a campsite, usually located outside of town near the railroad tracks. The jungle was a place where everyone was welcomed as long as they obeyed the rules. In the jungle, there was food, a place to sleep, and companionship. Both hoboes and tramps lived in a state of constant hunger, and rarely did either ever get enough food. The main meal, which was usually the main event of the day, was served in the evening, and was usually a large stew called "Mulligan Stew." Unless one was hurt or ill, to share in the meal one had to contribute. Those who did not bring food had to work as chefs or gather firewood, and everyone was required to clean up after himself. Many tramps and hoboes were self-educated and widely read in economics and political philosophy. After dinner, the men would often sit around the fire and share not only their political views and discuss social issues, but they would also tell stories about the adventures they had lived, the fast trains they had ridden, and the jails they had been in. They spent a great deal of time sharing their knowledge of daily survival: which policemen and judges to avoid, which towns were friendly and which were hostile. Because hoboes and tramps were constantly on the road and had no access to telephones, telegraphs, or the mail, they developed a complex system of communication. There was a system of signs used to let hoboes and tramps know whatever a "friend" felt was important for another friend to know. There were signs to let newcomers know where they might find a friendly or hostile reception, directions to a welcoming place, or warnings for hostile dogs, police, or thieves. Around these campfires they would also sing songs, recite poetry, and create their own individual works of art: the hoboes would whittle while the tramps would carve. This relatively little known form of folk art, called "tramp art," was produced by these anonymous skilled artisans in the hobo jungles of the U.S. but was introduced in the early 1860s by the German and Scandinavian Wanderbuersons, or wandering apprentices. These men-the trampers-popularized chip carving as they traveled the U.S. countryside in search of jobs or in the pursuit of the vagabond life. Chip carving had been used as a method of decorating wooden objects in Europe almost since the beginning of time. By using any sharp-edged tool, but most often a pocketknife, small chips of wood were removed from a larger piece to form geometric patterns. A simple V could be cut on the edge of a piece of wood, or an elaborate gouge covering a large surface could be used for more elaborate decoration. In the hobo jungles, it became commonplace for the trampers to combine chip carving and whittling when using their pocketknife on cigar boxes. The availability of cigar-box wood was a major factor in the production of tramp art. In the 1850s, the wooden cigar box came into use both in the United States and Europe. Since it was difficult to ship cigars cheaply and easily for packing into boxes, wherever cigars were made, cigar boxes were made nearby. At the turn of the twentieth century, cigar smoking was at its height because cigars were considered symbols of masculinity and affluence. Success bred competition, and competition meant advertising. As a result, cigars were magnificently boxed. Revenue laws did not permit the boxes to be used a second time for cigars, so enterprising souls found new uses for the boxes. 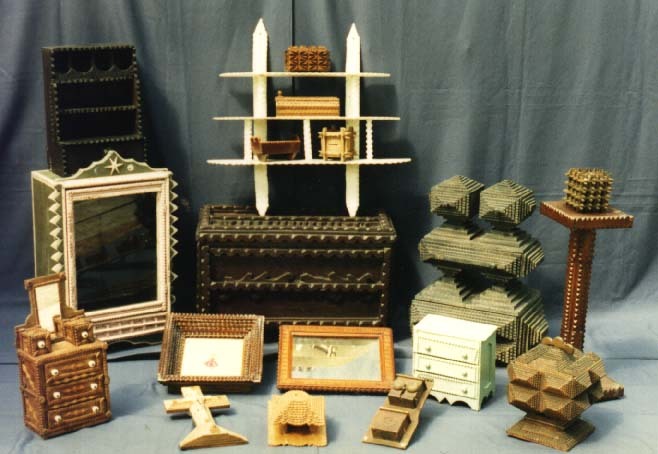 Since the boxes were plentiful and easily carved, ornamenting them by chip carving became popular. This technique of chip carving consisted of notching and layering, with each succeeding layer being a little smaller than the preceding one, to create a pyramidal design. One cigar box or many cigar boxes could be used for the frame of the piece as well as performing the decorative function. Either way, the carver had to have a great deal of time and patience to create his finished product. He had to notch-carve each individual piece of wood many times. Then he had to layer the individual notch-carved pieces of wood into some kind of recognizable object. And then he had to decide if he wanted to add further decorations to the piece. One of the most fascinating aspects of tramp art is the evident desire of the carver to produce detailed and often very skilled work with only make-do and simple tools. This layering of piece upon piece was done for decorative purposes, because it was felt that many layers of wood were more interesting-looking than just one layer. In addition to chip carving and layering, applied and inlaid decorations were another common feature used in Tramp Art. Since geometric patterns of circles, squares, and triangles were the easiest to carve, they were the most common type of applied and inlaid decoration. Hearts and stars were the most-used symbols for such decorations, and sometimes the entire object would be made into a heart shape. Another type of tramp art that was sometimes produced, but was not quite as popular as the traditional layering and chip carving, is oftentimes referred to as the "crown of thorns." It was made in a layered manner and was also constructed with cigar-box wood. In this style, the piece of wood was notched together in an interlocking and overlapping fashion the way a log cabin is built. As the pieces were interlocked, they were also layered and built up like vertebrae to form a star effect. Tramp art became a very popular art form because it allowed the tramp artisan to use the materials he had at hand to produce a great variety of things. Picture frames, gift and jewelry boxes, and full-size chests of drawers were created not only to fill his empty hours but so that they could be used as a gift for a friend, a barter for food or lodging, or an exchange for money. The tramp was likely to produce articles of a functional and practical nature, while the hobo whittled objects of art that were more whimsical and nonutilitarian." Hobo and Tramp Art Carving is no longer in print. You may be able to find a copy at a used bookstore or on eBay. 1. A short article on tramp art. 2. How to make tramp art. 3.How to carve a chain and whimsey. 4.The history of hobo art. Copyright © Artisans. All Rights Reserved.